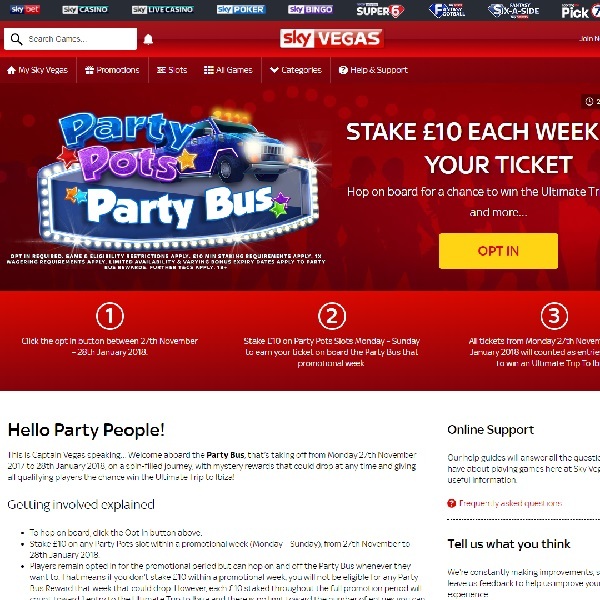 Sky Vegas has launched a Party Pots Party Bus competition and is giving you the chance to win the ultimate trip to Ibiza. First you have to opt in to the promotion. Then you need to start playing the Party Pots slot. Each time you bet £10 on it within a promotional week you will receive an entry to the prize draw and you have until January 28th 2018 to collect entries. Along the way there will be a number of bonus prize draws with cash prizes and more up for grabs and you will be entered as long as you have bet £10 that week. The top prize includes travel to Ibiza, sailing on a catamaran, a vintage Vesper tour of Ibiza, a parasailing experience, a £500 nightclub budget and £1,000 spending money. Make sure you don’t miss out, start collecting prize draw entries today.